Without fail, the number one question we're asked is, "How do you make soap?" Actually, it's a fairly simple--yet magical--process that is not unlike cooking fine food from scratch. The only difference is that we don't actually cook the soap (and we don't eat it!). Instead, we make soap in the time-honored "cold kettle" method, a process in which the soap is created at low temperatures ensuring the natural nutrients and healing benefits of the herbs and essential oils are retained--and made readily available to your skin. First, we gather the tools of the trade: Stainless steel pots and spoons, digital scale, wooden spoons, plastic pitchers and of course, safety equipment such as eye goggles, rubber gloves and protective clothing to handle sodium hydroxide (lye), which is what turns ordinary vegetable oils into our luscious, creamy soaps! Once all the components are assembled, we measure each ingredient to within 1/10th of an ounce. This precision is important for consistency, mildness and stability. It is what keeps our soaps so gentle and nourishing, instead of nearly tearing your hide off like Grandma's laundry soap used to do (Sorry, Grandma)! The first ingredient is lye (sodium hydroxide), which we will then mix with pre-measured, purified spring water. The solution will heat up to nearly 200 degrees in a matter of minutes due to the exothermic reaction--the same type of reaction which causes plaster to heat up when mixed with water. We'll let the lye cool down before blending it. While the lye and water are cooling, we move on to measure all the solid fats--or butters--which will make up the base of our soap. Here, we're measuring Organic Coconut Oil, which is responsible for the abundant, lovely lather that is a signature of WoodSprite Organic Soap. This is when we add organic shea, organic cocoa, mango and organic palm butters, too. Once all the solid fats are measured, they are heated to a low temperature of 100 degrees farenheit. This is the only external heat applied to a cold-kettle soap; just enough to melt the solid butters and fats together with the primary base of Organic Extra Virgin Olive Oil, which we feel makes a superior moisturizing soap. We'll also blend in other nourishing organic cold pressed oils like Sweet Almond, Avocado, Sesame or Kukui, which provide extra nourishment and moisturizing properties to the skin. While the lye cools and the fats melt, we measure out the Certified Organic herbs and botanicals, then the pure Essential Oils which give our soaps their intoxicating, irresistable natural scents. This batch is Patchouli, so we'll be using Pure East Indian Dark Patchouli Essential Oil and Certified Organic Black Walnut Hulls for a rich, chocolatey color. Now that all the oils are melted together and the lye solution has cooled to approximately 100 degrees farenheit, we carefully stir the lye into the oils. Using a spoon and hand-blender, we mix rapidly to ensure thorough blending of each lye molecule with each fat molecule. These molecules will all break apart and then reassemble into a totally new one, comprised of two fatty acids and a glyceride (glycerin), the magical secret which makes handmade soaps so soothing and moisturizing. This is creative alchemy at its finest! Gold for the skin. 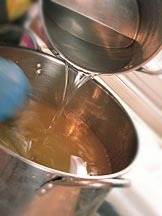 It only takes about 15 to 30 minutes of mixing for the lye-water and oils to thicken together, resembling a thin pudding. This thickening stage is called "trace", and it means that most of the molecules are now linked up. It's also the signal that we need to add the herbs and essential oils because the thickening will speed up fast! 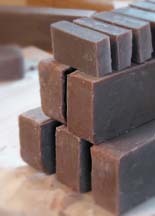 After all the organic botanicals and essential oils are added, the soap is very much the texture of pudding. It's time to pour the soap mixture into the mould--a lined wooden box that we can disassemble in order to cut the soap. Once all the soap is poured into the lined mould, we'll cover and insulate it with blankets, which will enable the saponification (or transformation into soap) to be completed over the next 48 hours. After 48 hours, the mixture will be a solid, 35-lb. block of pure organic soap. Once it is unmoulded and the liner is removed, we'll cut it by hand into logs, then individual bars. The cut bars will be placed on a curing rack and allowed to age over the next month--much like fine wine or cheese. This curing process allows the excess water to evaporate, making the organic soaps milder, harder and longer lasting. After a month, the cured soaps are labeled by hand and placed into stock, ready to be shipped to you.